In a follow up to my blog about Cusco, I have to tell you more about the actual reason why we went to Peru: we wanted to check out Austin Adventures’ Lodge to Lodge trek – and let me tell you, this trek is an experience of a lifetime! 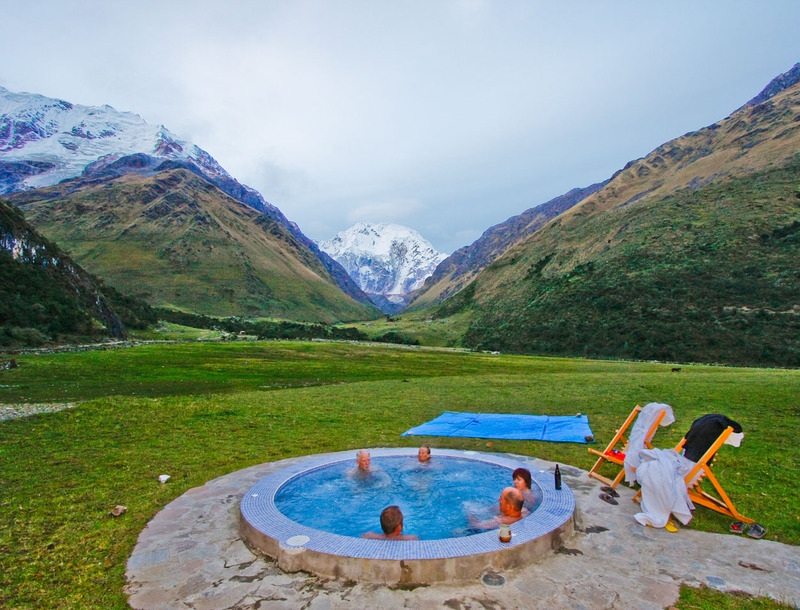 The trek itself and the fabulous lodges you spend the night in along the way are operated by a Peruvian company called Mountain Lodges of Peru, and wow, they know good service like the back of their hand. I was constantly amazed at not only the scenery and the epic lodges, but the special touches our guides and the lodge staff threw our way around every bend! I’ll share with you a few key features of the journey, as you really need to experience this trek yourself to take in all the majesty of the Salkantay Trail. First of all, the trek itself follows the Salkantay Trail forty-one miles over the course of seven days from the small village of Marcocasa to the train station that takes you over to Aguas Calientes (the town at the base of Machu Picchu). A disclaimer here: in no way is this trek “easy.” In fact, it’s the most difficult trip that Austin-Lehman offers because of the altitude of the trek (anywhere from 6,500 to 15,000 feet) as well as the elevation gain and loss (usually around 1,500 – 3,000 feet up and/or down in one day). The mileage itself isn’t horribly difficult, it’s just those long downhills and uphills. But I’ll also mention that you won’t notice any of these hardships because your surroundings are so beautiful you can’t help but ooo and ahhh around every corner! On this trek, in just over 40 miles, you pass through more than 15 different ecosystems!! From barren mountainous valleys surrounded by snow-capped peaks to green, lush flower-covered cloud forests, the scenery seems to change in the blink of an eye. Really, you need to see it to believe it! There were so many little things that made this trek the trip of a lifetime, but I don’t want to spoil any surprises for when you complete the Salkantay Trail on ALA’s Peru: Salkantay Lodge to Lodge trek. The whole point of this blog is to get you excited about the area and questioning if this sounds like the trip you’ve been searching for. If you want beautiful, long yet rewarding days of hiking mixed in with a bit of pampering at fabulous lodges, I highly recommend this trip. If you have any questions or want to know more about the Salkantay trek, don’t hesitate to contact me at 800-575-1540 – I have nothing but great things to say!